With two members attending the meeting through Skype, the ICW board held a very productive meeting in Moscow from 22-23 May 2016. 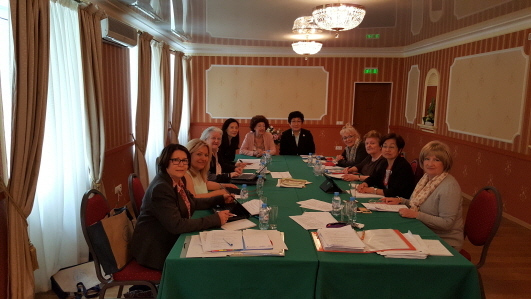 ICW President Jungsook Kim opened the meeting with an expressiion of appreciation to ECICW President Cosima Shenk, The Women Union of Russia President Ekaterina Lakhova, its International Secretary Elena Bashun and all their members for arranging a successful ECICW and their gracious hospitality to all the ICW members. She stressed the need to increase the visibility of ICW around the world and her efforts in this regard. Her activities this year began with a visit to Taipei in January 2016 to plan for the upcoming ECM in November. In addition to inspecting the venue, Grand Hotel, and meeting with NCW of Taiwan board members, she called on the National Women’s League as well as President Ma Ying-jeou and other important government officials of Taiwan, ROC to introduce the ICW-CIF and seek support for the ECM. President Kim lauded the extraordinary success of CSW60 with the participation of many ICW-CIF members and specially commended Vice-President Elisabeth Newman for her excellent coordination of the event. She expressed her appreciation to UN Secretary General Ban Ki Moon for taking time to meet ICW members at his office, certainly an unforgettable highlight of CSW60. Moreover, ICW-CIF members met every day and did their best to heighten ICW visibility at the UN. The ICW events, with interesting topics and highly demanded speakers, including the Deputy Director of CSW, Dr. Lakshmi Puri, and renowned women activist, Dr. Charlotte Bunch, successfully attracted large audiences. All the brochures of the ICW that Dr. Kim put on the tables were taken. She also spoke about the cordial and fruitful meeting with NCW of USA President Mary Singletary at their new office in Church Center. At the Board Meeting, the Treasurers, Martine Marandel and Anee-Elisabeth Iba-Zizen reported on the state of ICW-CIF finances since the October Board meeting in Luxembourg. The Board also reviewed the status of the various funds and projects, including LELAF, Lady Aberdeen Fund, Lydie Rossini Fund, Princess Prem NORDEA and 120 th Anniversary Fund, as well as reconfirmed financial governance procedures proposed by Vice-President Hean Bee Wee, Chair of the Finance Committee, to fulfill the board’s responsibility to monitor the finances of the organization. The Board also filled the remaining UN Permanent Representatives vacancies, appointing Brigitte Polonovski to be Liason Officer for ECOSOC in Geneva, and Isabelle Broquet to represent ICW-CIF at UNICEF. They also discussed the acceptance of new affiliations for countries that have formally requested membership since the first board meeting of this triennium. The board noted the improvement of the updated ICW-CIF website as well as the importance of the new brochure and three Newsletters in improving the visibility of ICW work in the world. Board Members expressed their appreciation to Dr. Kim for her dedication and efforts in publishing these documents. The Board unanimously decided to keep the triennial theme, Transforming Society through Women’s Empowerment, for the ECM in Taipei from 14-17 November 2016, evaluated the agenda and discussed the budget. President Jungsook Kim expressed the need for the ICW to take advantage of its international events to reach more women around the world. To achieve this, the board decided to allow observers to attend the ECM. ICW Vice-President Linda Liu remarked on the great anticipation and excitement of the members of NCW of Taiwan for the upcoming ECM and especially, for welcoming their ICW sisters to Taiwan. Before closing the meeting, President Jungsook Kim thanked Cosima Shenk for her longstanding dedication and leadership, and in particular, her guidance, assistance and participation at the board meetings this year.